1. Need to install Java. 2. Need to upgrade Java to the latest version. 3. Need to add IP address of the NVR into the trust website list in Safari. 1. You can download the current version of Java for OS X directly from Oracle's website. The installation procedures can also be found on Oracle's website too. 2. Please upgrade the latest Java version in MAC OS. You can follow the procedures shown below for your reference. STEP 1: Make sure the Internet is accessible in your MAC OS. then, go to "System Preferences". Scroll down and find "Java" application. STEP 2: Click on "Java" application icon for opening "Java Control Panel". STEP 3: Go to "Update" tab. It will check automatically for any Java update if you've select using "Check for Updates Automatically." STEP 4: If there is any Java updates needed, related information will be shown. Please simply click on "Update Now" to update Java. STEP 5: A software update confirmation window will be shown. Click on "Install Update". STEP 6: To install Java update, it requests for administrator authorization to get the installation procedures proceeded. Please fill in related administrator user name and password and click on "Install Helper" to proceed Java update installation process. 3. Please follow below steps to add NVR IP address in Safari trust side. 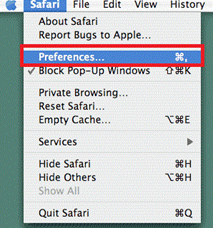 Step 1: Please go to the safari Preferences setting. Step 2: And then go to the Security --->Internet plug-ins. Click "Plug-in Settings..."
Step 3: The "Currently Open Websites" list will pop up. Press "Option" key on your MAC keyboard. Step 4:Select "On" and uncheck "Run in Safe Mode". Step 5: Please click "Trust" to add your server IP as trust site. Step 6: Click "Done" to finish the setting. Step 7: Refresh the web and the Security Warning message will pop up. Click "Allow' to access Java from the website. The live view/playback would be able to display accordingly.